In my opinion, Legacy, the eternal format, is a deeper and a more balanced format in Magic than any other, and there are many great situations and interactions within it, which are the most valuable charms of this format or in the game itself. I am going to start with one of my best legacy decks – Punishing Jund. This was the first deck that I have played with in the legacy format. It is kind of a funny story for me, as I had rebuilt my modern Jund deck to begin playing in an eternal format. There were not a lot of differences between the modern and the legacy Jund deck from year 2013, where Deathrite Shaman-s and Bloodbraid Elf-s were still legal, but at the moment there are some clear differences. First, take a look at my main deck list and its final shape that had been reached after a few years of playing. We `ll take a look at the sideboard list latter. Now that you have a better presentation of the deck, we can start to ponder about the reasons for choosing the cards that are currently in the deck. Almost all of them are a part of usual Jund`s deck list, but I think that the number of copies of a card inside of the deck are still the player`s choice. For me this is the best creature in the whole Magic game! For just one mana (besides being able to choose between black or green) it does a lot of things when in play. It can provide you with a faster and more aggressive play style at the beginning of the game, with a ramp option by removing a land card from a graveyard to add any color of mana to your mana pool and in some cases, it can also help you win in the late game. The most special characteristic of this creature is, that it can hit the graveyards for a low cost. You can remove lands, instants, sorceries or creatures with it; additionally, you will also gain or take two lives from an opponent. Possibility for removing instants and sorceries from graveyards in legacy is great for negating some spells with threshold and flashback abilities. With an active Deathrite Shaman on the table you can also make Snapcaster Mage only a 2/1 creature with flash. The other option is to remove a creature card from the graveyard. This ability is great against decks based on their graveyards like Reanimator and Dredge. It also gives you two additional lives, which is also important as well. You will need those lives at some highly pressured matchups against decks like Burn or Eldrazi Aggro. I think that there is no doubt in playing four copies of Deathrite Shaman. If we look at this card`s name, we can see that we have to trust this card. Its power is insane! If it survives a few turns on the battlefield, you will probably win the game. Sometimes you`ll also lose a game with Dark Confidant in play, if you`ll be careless or out of luck. But when taking its power into, this is negligibly small. Through whole picture this card is a great advantage, and that is just what Jund needs. This is your power body and it also leads to the win condition in many matchups. Its power and toughness can increase fast because of your discard spells, so don`t be surprised if it becomes a 4/5 in your second turn. When you play with this card for a while and see what it does, you`ll know why it is so valued, trust me. This is a card with the highest converted mana cost in our deck, and that is good because of its cascade trigger ability. It also represents some sort of a card advantage. Cascade ability in this deck is really powerful in most cases but it can still do nothing if you reveal Thoughtseize or Hymn in the late game, or Abrupt Decay without a target. Bloodbraid Elf is also a creature with haste, so it is great against planeswalkers. Some other Jund players are using Goblin Rabblemaster instead of Bloodbraid Elf, which is also a good card for this deck, but in my experiences, card advantage from BBE is more important. Three copies of this card in Jund is a perfect number. Four would be too much, two should be possible, but I think that you`ll probably be missing the third copy. Ok, we got through the creature package. Some of you might also find a place for a copy of Scavenging Ooze or Grim Flayer. Better place for Scavenging Ooze is in sideboard, unless if you expect a lot of decks based on a graveyard. Grim Flayer can also be good, and some sort of a card advantage too. It can help you to find your Punishing Fire-s. Try to play with it, maybe you will like it. We have two copies of a Lightning Bolt, our cheapest removal spell for creatures, planeswalkers and also good for head shots. It is great and necessary against annoying one mana dorks like Mother of Runes, Goblin Lackey, Delver of Secrets, Elvefs and some others. I would play more of them, but unfortunately there is not enough space. At the moment where there are a lot of Eldrazi decks or depending on the metagame, you should change one copy to Dismember. Maybe in the future, there will also be a place for a copy of Fatal Push. Three copies of Punishing Fire, a card from which the deck is named; so it should be a good card. It is, it `s very good. 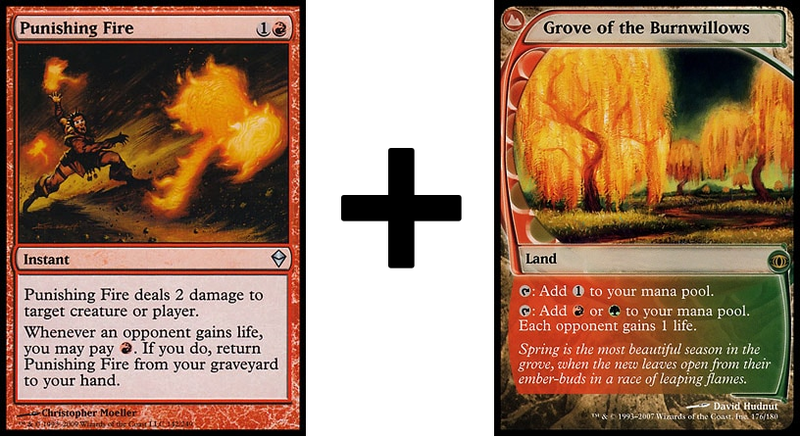 We have a combo here with Grove of the Burnwillows, which enables us to have a removal spell in hand in each turn. I think this card makes Jund so great in comparison to the other agro decks, because this combo is a nightmare for them. You can also win the game with it by hitting your opponent on each turn for one or more damage. You can use it for Liliana`s first ability too, and bring it back with Grove. Same as for Lightning Bolt, there is no more space for the final copy. There is no reason why we wouldn`t play Abrupt Decay-s. The best quality of this card is, that it can`t be countered. It has a lot of different possible targets. It is great against equipments, cheap creatures and some planeswalkers. It also shuts down annoying Chalice of the Void and makes an end to a Counterbalance – Top combo. With Maelstrom Pulse I have replaced the fourth copy of Abrupt Decay. You will need this card at some matchups. It is very powerful, because it can hit almost anything on the battlefield and it has a lot of great targets against some of the most played decks at the moment. It can help you to remove all of the winning conditions of Miracles (Angels, Jace and Mentor), it destroys Batterskull, Sneak Attack, horde of tokens and can kill all of the »small« Eldrazi-s.
One copy of Kolaghan`s Command has found a place here, because of the many possibilities that come with it. It represents a choice for a four different »goods«; card advantage, card disadvantage for your opponent, permanent removal and a shot at the player`s life points. Try to imagine what happens when you will use this spell against Death & Taxes or Stoneblade? It can be also a great card against Miracle deck to take their miracle spells, if you discard them with other discard spells before. Maybe someday we`ll find some space for another copy in a sideboard. I think, that this package of cards is enabling Jund to be a competitive deck in legacy. It is your only way to fight against some combo decks, which are really bad matchups for Jund. Thoughtseize-s are great, and sometimes you especially need them in your first turn of the game. This card can be also useful later in the middle stage of the game by discarding some value cards (Jace, Batterskull …). Same thing is with Hymn to Tourach, you need that kind of a card and additionally, this card is very powerful. It can take any two cards from an opponent`s hand by a random choice, and that is pretty brutal. There will be some games where you`ll be able to win with just casting this card, by discarding two lands. It can also be worse…but I think 2 for 1 is never bad. If opponent will Force of Will your Hymn, that is not a big deal – he or she`ll take away two cards as well. All I want to say here at this types of cards is, that you must find a space for them in Jund deck to fight against combo and control decks; usually 7 – 8 cards are used and some additional spaces in your sideboard as well. Here is another insane card, which can be used for discarding your opponent or killing their creatures or permanents too – Liliana of the Veil. First I played with three copies of this card, but when I have realised how powerful this card is, there is no more doubt to play four of them. Players with some specific decks are most afraid of this card, when facing Jund. It is a big problem for Miracles, Canadian, Eldrazis, True-Name decks, and many others. It is also your best card in a mirror game. All three abilities of this planeswalker are very good. First can be good against almost any deck, second can kill a creature without targeting, and its ultimate ability is reachable and quite strong to clean the part of an opponent`s board. This card is your draw machine and you`ll want to have it in play. This is the fifth Dark Confidant (or even better; except it can`t attack or block), and it is also very good in combination with it. Library can win you some games if you know how and when to use it. It also makes your fetch lands more valuable and it perfectly matches with cascade ability of your Bloodbraid Elf-s. Some other advantage cards instead of Sylvan Library could be: Sensei`s Divining Top, Mirri`s Guile or even Life from the Loam (it can bring your Punishing Fire-s to the graveyard). If there would be some more space I would try with Loam. Another Library would be also ok, but I think nobody wants to have both in their hand, or in play at the same time. I was testing a lot of different options of the correct number of lands for this deck. 22 of them is not enough, 24 is a good number, but then our space for the spell cards becomes thinner. I have found, that 23 is the perfect number, and we still have another possible mana source – Deathrite Shaman-s. The number of fetch lands is also important; I would recommend you a minimum of eight. I think two basic lands are enough. If there would be a space for one more, it would be another Swamp. Three Wasteland-s are necessary, and I think you already know how good they are. About choice for dual lands, I think your own choice should be the best. Most of decks are including three Badlands and three Bayou-s. Reason why I`ve put Taiga in deck is, that I had some situations where I needed R/G mana for the next turns and I couldn`t get both. But if we think about both sides, it can also be a problem, especially in some of your opening hands where you can draw all non-black lands with no fetches. And for Grove of the Burnwillows it is clear, that they are there for Punishing combo. We got to the sideboard. Bellow you can see the chosen cards for my sideboard. I`ll tell you what they are good for and what they are there for. Pithing Needle is cheap card with a lot of options to choose from. It is good against Miracles, Sneak&Show, Reanimator, Lands, Death&Taxes, Elves … and this are some of the most popular decks in this format. It is very useful card, and important for your hard matchups (Lands and Sneak&Show). Duress is here just for increasing the number of low cost discard spells in your deck, which are necessary against most combo decks and some control decks. Other options can be Inquisition of Kozilek or Chains of Mephistopheles. Surgical Extraction is also great against combo decks and some others (Loam, Miracles, mirror…), and most important Lands, which I think it is one of the worst matchups for Jund. It has a great interaction with our discard spells too. Pyroblast-s are the most important cards in our sideboard. They`re good almost against any blue deck, and there are a lot of blue decks. Pyroblast is here to counter Show and Tell, True-Name Nemesis, Ancestral Vision, Force of Will, to kill Jace, Delver, Merfolks, Back to Basics, Omniscience or just to deal with cantrips. I had chosen Pyroblast-s instead of Red Elemental Blast-s because with Pyroblast you can fill your graveyard for Tarmogoyf or Deathrite Shaman if there is need for that. It can also go to the graveyard if it is revealed by the cascade ability. Diabolic Edict is good for removing »untouchable creatures« like True-Name Nemesis, Nimble Mongoose, Mirran Crusader and Marit Large. Golgari Charm is a useful card with several options. It is great in creature matchups, and it is important for destroying some powerful enchantments like Counterbalance, Sneak Attack and Omniscience. You can also use it in mirror game to kill Bob, Sylvan Library or to protect your permanents with regeneration. For Choke I don`t have any special words. I think we all know, that it is perfect for destroying game plans of some blue decks. Toxic Deluge is the best card to remove a horde of small creatures. It can be used also for bigger creatures like Tarmogoyf and Eldrazi-s. Sometimes it will be also your rescue from a bad situation. Ok, that`s it. We got through the whole deck. If I forgot to mention something important I`ll do it in the next article(s), where I`ll describe Jund`s position in a different matchups and some tips how to sideboard. Your feedback, comments and questions are welcome. Thank you for reading!